The memorial service is scheduled to begin at 1 p.m. at the St. Joseph’s Catholic Church, followed by a memorial service at Pinole fire station 74, located at 3700 Pinole Valley Road. In lieu of flowers, donations can be made to the University of California at San Francisco Brain Tumor Research Center through the UCSF Foundation. Donations can be made online or checks can be mailed to UCSF Foundation, P.O. Box 45339 in San Francisco. PINOLE (BCN) — After more than three decades of service, a Pinole fire captain will be honored Saturday for his dedication to protecting the city and surrounding area and for his advocacy for fire service. Fire Capt. Rich Voisey died earlier this month after a nearly two-year battle with brain cancer. He is receiving the full line-of-duty death honors, said Contra Costa County Fire Protection District Capt. Vincent Wells. Wells said that because firefighters experience a higher rate of cancer-related deaths than in other occupations, the state of California recognizes cancer as a work-related injury. “We treat it just like he died in a fire,” Wells said. Wells got to know Voisey when they were both working as district representatives for the United Professional Firefighters of Contra Costa County Local 1230 union, where Wells is now president. 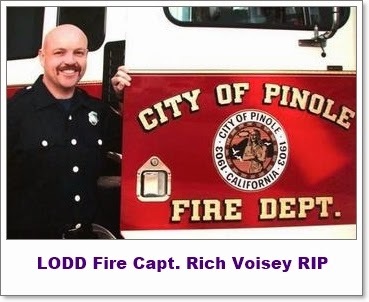 Voisey, who boasted a bright smile, handlebar mustache and bald head, was best known to those closest to him as a tireless advocate for his fellow firefighters, a man who was outspoken and passionate about firefighter safety. He was completely dedicated to his family – his wife and three children – and his “fire family,” Pinole fire Capt. John Madigan said. He was a leader in the department, his coworkers said. “He wanted to make sure that guys were safe. That was one of his driving forces, to make sure that we finished our shifts and got to go home safe to our families,” Madigan said. Voisey served on the leadership board of Local 1230, eventually rising to the rank of vice president, Wells said. He was relentless in advocating for the construction of Pinole fire station 74, which was built to serve citizens in Pinole Valley, where there was no fire station. Although the station was shuttered in 2011 due to budget constraints, Madigan said it is a monument to Voisey’s efforts. It’s fitting that the station will serve as the location for the memorial reception, he said. A true family man, when Voisey was diagnosed with brain cancer, Wells said he established a few goals for himself in his remaining days. One was to see his daughter get married and the other was to see his son graduate from college. He was able to do both of those things, Wells said. Outside of the fire station, Thompson said Voisey was an avid fly fisherman who enjoyed camping and riding motorcycles. He was an unwavering Raiders fan, Madigan said. Wells said Voisey was the kind of person who would always look out for other people first. True to form, when he died, Voisey made sure his body would be donated to a cancer research center. Voisey is survived by his wife, Nancy, his daughters Sasia and Sarah, his son, Joshua, and granddaughter, Autumn.